Suspected Taleban militants have killed one policeman and wounded four others in an attack in southern Afghanistan, officials say. An official told reporters that some militants also appeared to have been killed in the fighting in Nimroz province on Wednesday. But a man claiming to represent the Taleban has denied any casualties. Violence has increased as the US plans to hand more responsibility for south Afghanistan's security to Nato allies. Nimroz governor Ghulam Dastagir Azad told Reuters news agency that some 60 Taleban militants were involved in Wednesday's attack on a police post. He said the militants seemed to have taken their wounded or dead away when they fled. "We are hunting for them," he added. A man claiming to be a Taleban spokesman told AFP news agency that they had not suffered any casualties. "Yes, we carried out that attack but we had no casualties," the man, who called himself Qari Yousuf Ahmadi, said by phone from an undisclosed location. The attack happened on the day when 150 British troops arrived in neighbouring Helmand province to help in the reconstruction effort. The soldiers will be the first combat troops of the new British deployment, part of an expanded Nato force in southern Afghanistan. The contingent is replacing a much smaller US force which is hunting the Taleban. Earlier this month, fierce fighting between troops and Taleban fighters in Helmand province left at least 25 dead. Last year, attacks mainly in southern and eastern Afghanistan left more than 1,400 people dead. 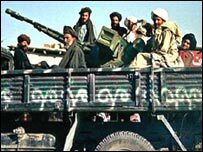 It was the country's bloodiest year since US-led forces ousted the Taleban in late 2001.